Our meet your farmer posts feature a small family farm that we feel exemplifies the type of food system we all need to support. They show passion and dedication to raising and growing food sustainably. This month we got the opportunity to check out this awesome 4 acre certified organic orchard in Vacaville, California called Sunny Slope Orchard owned by Bill Spurlock and Fern Henry. Unfortunately we didn’t get a chance to meet Fern as she had a prior engagement, but Bill was an incredibly gracious host. I had first learned about Sunny Slope Orchard from one of the episodes on the Perennial Plate (I’m hoping to do a feature on River Dog Farm in the future and as you might know, Esperanza of Pluck and Feather is a dear friend of ours.. The Perennial Plate Episode 63: Three Farms, One Dinner from Daniel Klein on Vimeo. 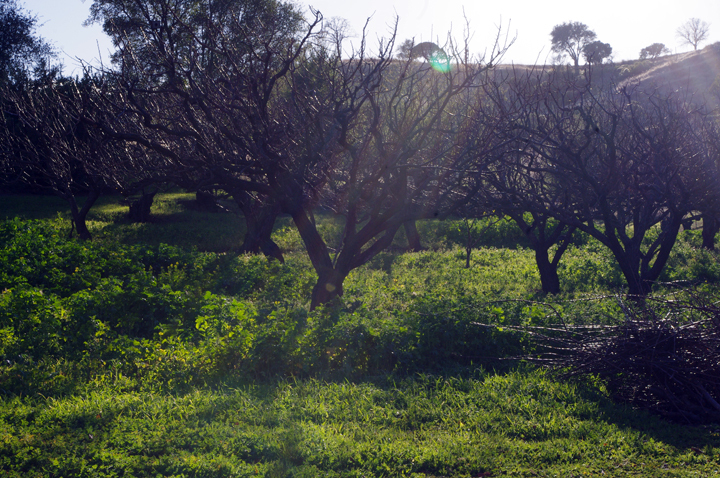 The majority of Sunny Slope Orchard is made up Royal apricots, Spring Crest Peaches, and three varieties of plum (Santa Rosa, Beauty, and Formosa). 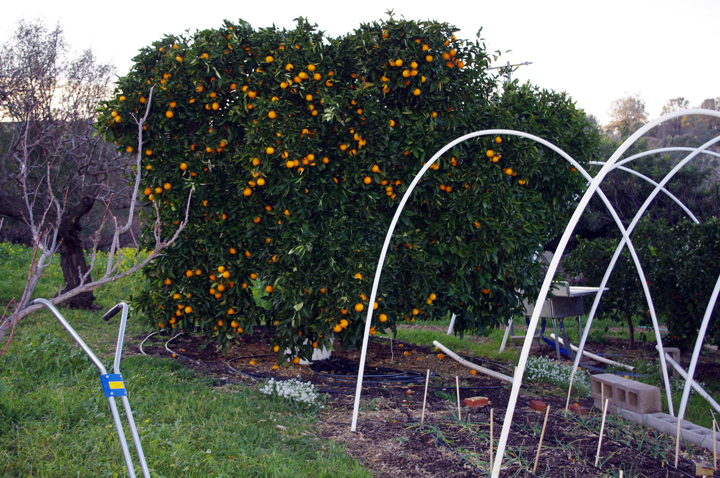 They also grow a variety of citrus, Fuyu persimmons, Black Mission figs, walnuts, and one pear tree. They moved to the property 40 years ago in the Back-to-the-Land movement. There were some very old fruit trees there and then they planted additional trees. The most amazing part though was that other than the citrus trees and persimmon trees, they didn’t purchase any other tree. Instead they would take suckers from the wild plum rootstock and graft scions to it to create new trees. This way, when the very old trees began to die they were able to revive them or replace them with the same tree. The other amazing part is that they grow all this fruit without having much available water. They have a few low output wells so instead of using all of their water on them they dry farm, which involves taking really good care of the soil. They plant a cover crop around the trees and then mow it down leaving an even mulch. There are a few drip emitters laid out and then covered with compost, which brings feeder roots to help nourish the trees. I have to say that his land management is quite amazing. We came right after a big rainstorm and were expecting to be tromping around in the mud. To the contrary, the soil was damp but definitely not saturated. All of the organic matter that he adds (25 tons a year of compost) just soaked up the rain like a sponge while his neighbor’s property was a river of water. 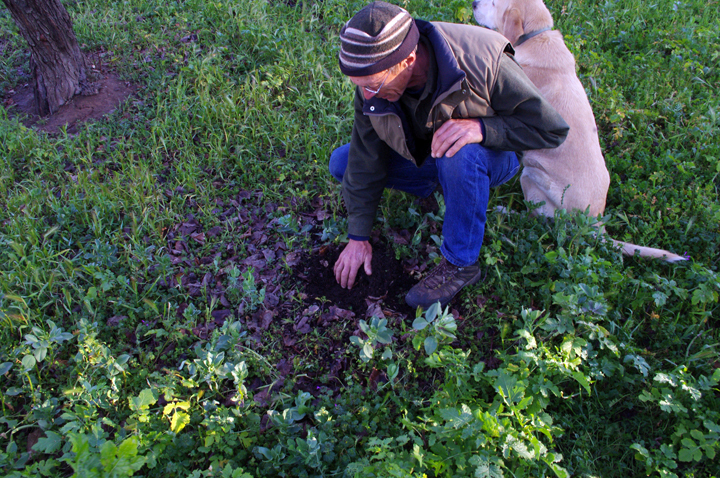 You can read more about his soil management here. What this dry farming does to the fruit though is nothing short of phenomenal. It concentrates the flavor and sweetness because there is less water in the fruit. Bill was kind enough to send us home with a few Navel oranges that were to die for. Bill helped us figure out why our little orange tree that we brought back from the brink was always so sour. We had assumed that it was a Navel orange but when looking at his Valencia orange compared to his Navel orange it became clear that our tree was also a Valencia. He recommended that we leave the fruit on until June to allow it to sweeten up. Sunny Slope Orchard primarily sells their fruit to restaurants – Chez Panisse being their biggest customer. The reason for this is because they, unlike big industrial orchards, allow the fruit to ripen on the tree and when it’s ripe it has to be picked and sold immediately. The fruit can’t sit and wait for a farmers’ market or CSA pick up. 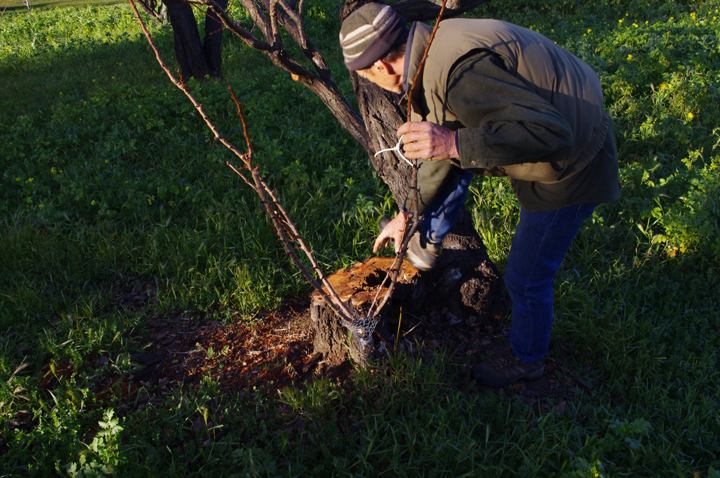 To be honest, I’m not that well versed in fruit trees, but Bill got me really excited about them and we learned so much from him even in the short time we were there. I’m looking forward to learning more about fruit trees and experimenting with ours. Sounds like a really informative visit! Do you know if they have a farm stand that sells to the public? Hi Janice, yes we do sell to the public by appointment. You can use the Contact link on our blog to ask to receive email notifications when fruit is available. That’s what I love about grafting, it gives you the option to preserve existing trees. There’s an ANR publication through UCD called ‘Home Orchard’. We picked up a copy in Davis this weekend, but I’m sure it’s on the ANR website. I like it because it covers various grafting techniques, but also is illustrated in color (including fruit tree pests). Definitely worthwhile if you’re going to venture further into fruit!